The “Clever Cup” allows users to top up their existing balance and monitor their spending whilst also delivering the ability to cancel or block the contactless payment element online using the unique bPay app which is available for Android and iPhone devices. The cups which were introduced in branches across the UK from November will cost £14.99, with a £1 donation from every sale going to the Costa Foundation. Not only does the cup deliver the added convenience of added contactless technology but the cups are sold in packaging made from recycled coffee cups. The Clever Cup features a silicone base and contactless chip, which is detachable for ease of washing and to date the feedback have been really positive from customers. Costa is hoping the introduction will encourage customers to ditch single-use takeaway cups. How does the Costa “Clever Cup” work? Put quite simply, the technology within the cup can be used wherever customers see the contactless symbol and not just Costa Coffee stores. Why are contactless payments so appealing for coffee drinkers? In today’s fast paced society, coffee drinkers are now looking for a seamless way to pay for their favourite past time. 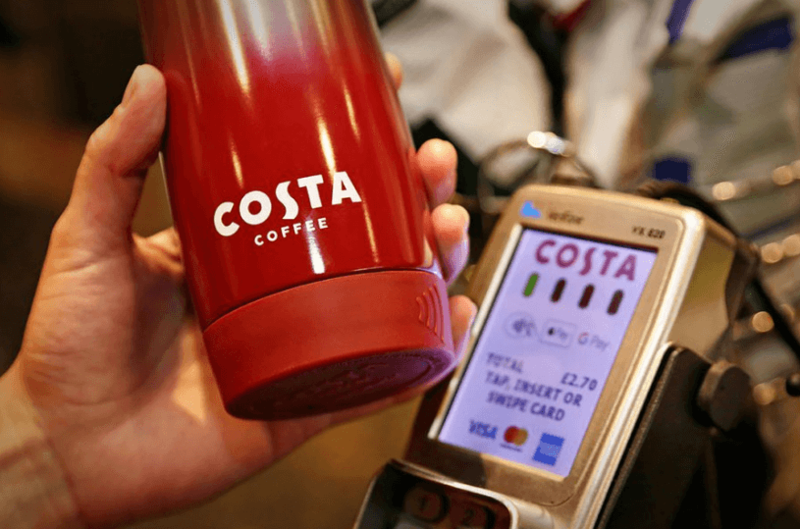 Costa’s versatile contactless chip technology allows customers the opportunity to unlock the bountiful of benefits that come with contactless technology. Costa hope the introduction of the Clever Cup will appeal to tech-savvy customers to help facilitate and drive environmentally friendly behaviour. What next for contactless technology on the high street? With this introduction and simple concept, the potential is massive. A similar trend could be applied to many other marketing tools on UK high streets. For example, you could see the potential transferred across to Premier league football teams who could apply this chip with their favourite football team logo, and use this for serving soft drinks and alcoholic beverages. A similar scenario could be played out in gyms with protein shakes or other health supplements. How much does the Clever Cup cost? The cups which were introduced in branches in the UK from November will cost £14.99, with a £1 donation from every sale going to the Costa Foundation. How much can you top up the Clever Cup by? You can load your Clever Cup up to £30 in credit to pay for goods, including coffee, anywhere that accepts contactless payments. A dedicated app allows customers to keep track of their spending and add more money to the cup. What are your thoughts on the introduction of the Clever Cup. Will it change the way you purchase your favourite cup of coffee? As ever we’d love to know your thoughts on the matter. Comment below or email sales@wirelessterminalsolutions.co.uk. What are four ways to boost sales for a business owner at Easter? What are the top 5 Mother’s Day marketing ideas for your retail business? My card machine isn’t working, what do I do? All numbers that start with 03 are charged at the same rate as standard landline numbers.